Browse our in credible Mozambique honeymoon packages to Azura Retreats Benguerra here. We have unbeaten honeymoon deals to the Bazaruto Archipelago that include flights and transfers as well of loads of free extras for the bride and groom. 40% off for the bride to Azura Benguerra! Complete privacy in your luxurious beach villa where the two of you can feel alone in paradise. 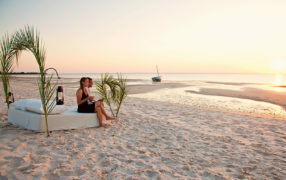 The best of the Bazaruto Archipelago beach resorts on this honeymoon package. If this is not what you are looking for browse our amazing selection of honeymoons to other destinations in Mozambique here. From exotic islands in the the Bazaruto Archipelago and other incredible beach lodges and resorts!